Season 4 of Downton Abbey starts tonight. I almost missed it. Thanks to those bloggers I follow who are more in tune with the seasonal television events. I appreciate the heads up!! The one thing I do know about that airs tomorrow is the BCS National Championship Game! Scott is in LA right now and he is so psyched to be going to the game tomorrow. We will be watching from Auburn and cheering on our beloved Tigers. War Eagle everyone!! Today, I was finally able to frame three of the remaining four cross stitch pieces that I still did not have framed and hung. The fourth one will be done in the next month or so, but at least I was able to complete these three. 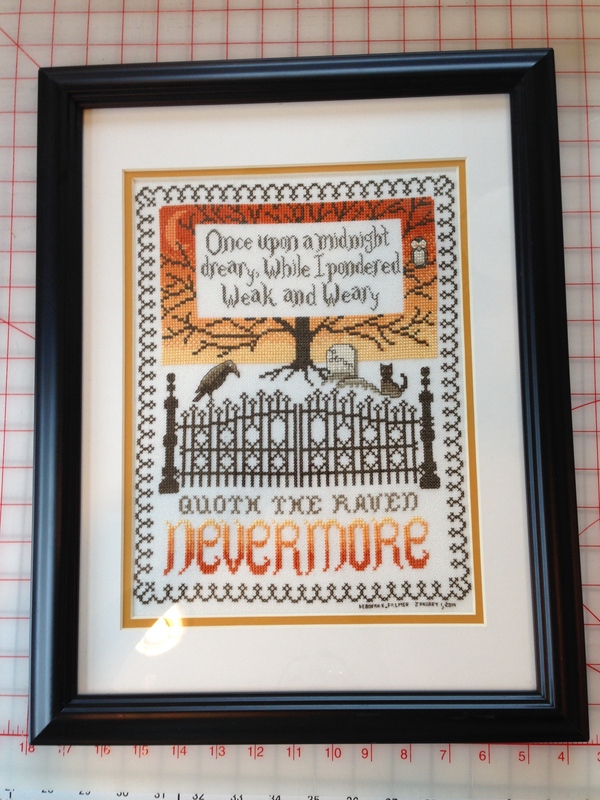 The first of the three is the Nevermore piece that I completed for Scott for Christmas. He picked out the frame and the mat and I think it looks great! Second is a sampler from a stitch-a-long I did over a 6 week period. 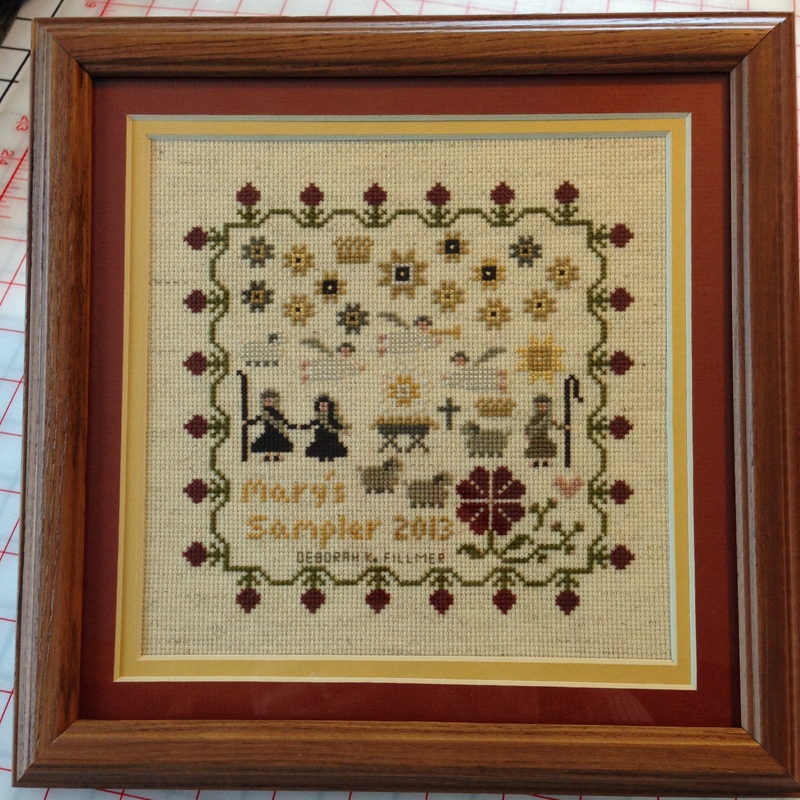 The sampler was quite easy and not very time consuming at all. I like the final result. And, finally, I framed perhaps the oldest unfinished project I think I have. 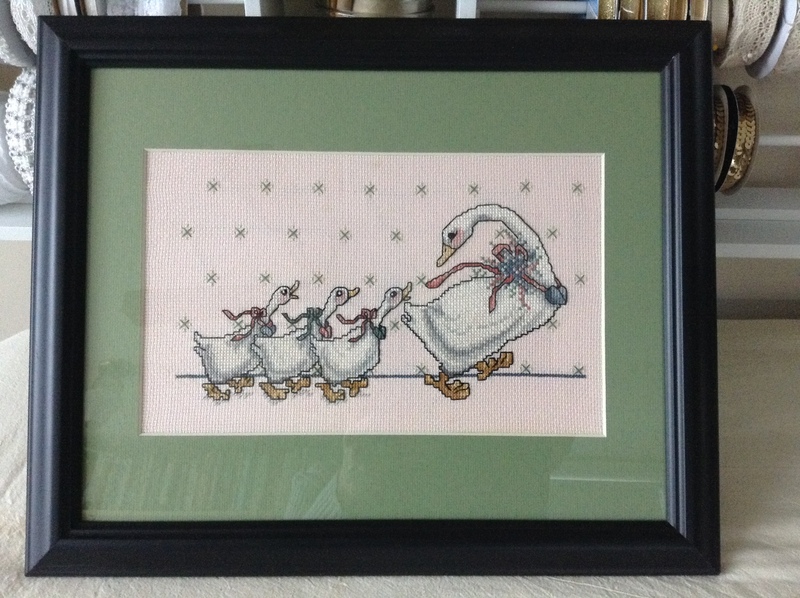 This piece was stitched in 1987-89, when country blue, stuffed bunnies and geese were all the rage. The one thing I remember about this design is that the goose is named Gertrude. I can’t believe it is finally framed and hanging on the wall. Hooray for perseverance! I bought a lap hoop when I lived in Pelham. I was staying at a campground in our 5th wheel. is the same person? I absolutely love my hoop and have used it ever since I purchased it from you. ( if this is the right person) LOL.